In early January, Novartis selected Qualcomm Life as a global digital health collaborator for its Trials of The Future program. That program is designed to leverage healthcare technology to improve the experience of clinical trial participants and patients using Novartis products. Qualcomm Life’s 2net Platform is the global connectivity platform for collecting and aggregating medical device data during trials, with the goal to improve the convenience and speed of capturing study subject data and test results to ultimately gain more trial efficiencies and connected experiences for participants. Novartis is currently using the 2net Platform in an observational study that is evaluating the use of mobile devices with chronic lung disease patients. Also in January, Oracle announced the availability of its InForm Medication Adherence Insights Cloud Service, which uses technology acquired from Proteus, an FDA-approved ingestible sensor platform. When combined with clinical trials medication, it can provide rapid validation of the quantity of medication a patient ingests and the time of ingestion of those drugs. It helps identify medication adherence issues early, improving dosage decisions, and enhancing drug safety. And late last year, Medidata Solutions announced the completion of a method development project conducted with GlaxoSmithKline to evaluate the impact of unifying mHealth devices with cloud-based technologies in a clinical trial setting. The collaborative project took place at GSK’s Human Performance Lab. Program participants were provided with two wearable devices to continuously measure vital signs, electrocardiogram (ECG) data and activity levels. In addition, participants used Medidata Patient Cloud®, a mobile app for patient-reported outcomes and they carried smartphones that captured data from the mHealth devices, which then pulled data into the Medidata Clinical Cloud® and mapped it to clinical records. The program demonstrated that mHealth technologies have the power to comprehensively collect large volumes of objective data that is reliable, secure and analysis-ready, and provides real-time, continuous insight into the well being of patients. All of the data collected was audited and is compliant with FDA regulations. Additionally, the effort indicated that mobile devices can support the long-term goal. Medidata intends to use the technology infrastructure developed for this initiative as a model to enable new Phase I–IV mHealth clinical trials, which the company will be supporting for clients over the coming months. More information is available at http://bit.ly/1C7A0Yv. These developments point to the increased use of mHealth and digital technologies provided by pharmaceutical companies to help improve clinical trials. But what is the uptake in the industry? And is mHealth poised to change the clinical trials landscape? Applied Clinical Trials and SCORR Marketing collaborated on the survey “mHealth Use in Clinical Trials” late last year to answer those questions and identify trends and attitudes among professionals involved in clinical trials. From FDA involvement, to the definition of mHealth to the benefits and challenges of mHealth, were included on the survey. Top-line results, such as those presented in the chart, show an almost equal use of mHealth in clinical trials as to not using mHealth technologies in trials. 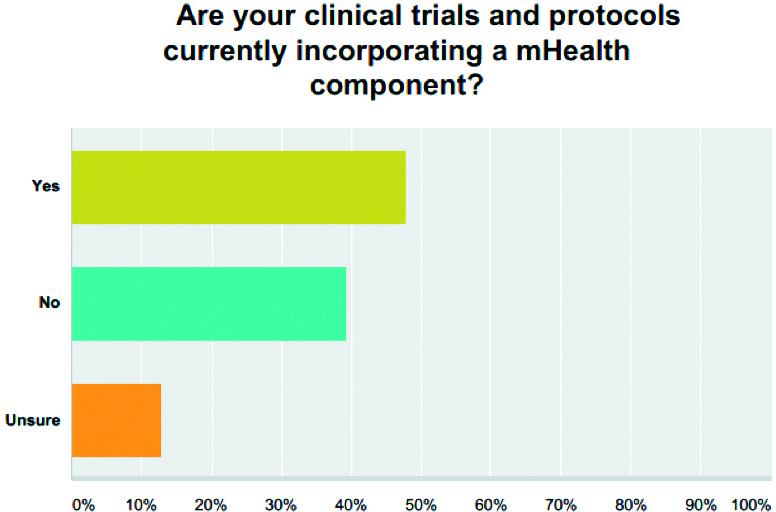 Yet, another survey question showed that the majority of the respondents have been using mHealth technologies in clinical trials for over two years. Applied Clinical Trials will continue to cover mHealth as it emerges in our industry. SCORR Marketing has created a full report from the survey results, which is available for download at http://bit.ly/1Es4Uc3.